I spoke to a gentleman this week who has had his house on the market for three years. And in that time, he has only had three viewings. Really. He sounded utterly despondent, and no wonder! So what can you do when you just aren’t getting any viewings at all? Here’s my action list to help you to address the problems, and improve your situation – cut out and keep it! Presentation – ask a friend to walk round your house with you, and write down all those little jobs you’ve been meaning to get round to doing. Ask her to point out any area that is particularly personal, like name plaques on doors or a photo gallery. De-clutter, de-personalise and add shine through dressing and accessories. Photography – get in a pro! If neither you nor your agent can afford it, then read my Six Secrets to Fabulous Property Photography and get the best shots you possibly can – including some lifestyle images – to make your house look like a magazine shoot. Description – brainstorm with your family and come up with the best descriptive words to describe your home. Use emotion and feeling to really get across the essence of your home. Rightmove ad – keep the text in your summary advert short and sweet. Write a snappy headline of no more than a line, to encourage clicks. Pick the best ‘lifestyle’ image that represents your home and ask your agent to use it as the main shot on your advert. Estate Agent – is your agent fully on board? If not, get another! Newer agents are often hungry, with something to prove. Offer them a great commission to incentivise them to sell your house quickly; this is not the time to scrimp on fee! Prepared? – have a plan that you stick up on the inside of a kitchen cupboard so that as soon as a viewing is booked, the whole family can spring into action. Whether it’s moving the cars off the driveway, taking the dog out for a walk, or having freshly laundered bedding ready to pop over the top of the beds, having a plan will make sure you have a professional approach to your viewings when they do happen, which they will! 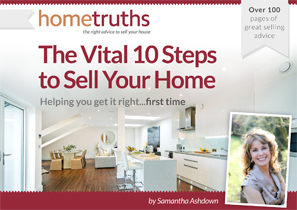 If you aren’t getting viewings, perhaps it’s time to call in an expert – me!